Director Amy Massari's children, Caleb and Jesse. From left, Cadence Dobson as Princess Fiona, Kagan Vann as Shrek and Caleb Massari as Donkey before the production of “Shrek: The Musical Jr.” at the North Fort Myers Academy for the Arts on June 23. The North Fort Myers Academy of the Arts started a theatre summer camp 4 years ago. This camp takes on the task of creating a full musical production in the matter of 18 days. With a crew of 15 kids, and a cast of about 40, this is no easy feat. This season they put on "Shrek the Musical." We got in touch with the director and production manager of the show Amy Massari to learn more about the making of this show. Massari has been directing this summer series since its inception 4 years prior. She remembers their first show, Suessical the Musical, with vivid memory and reflected that Shrek was on par with that first performance. Since then, the program has greatly improved and expanded. Now, the program performs 3 separate show as opposed to just one. Massari has been in the theatre industry for over 28 years, adding knowledge and experience to the program. She has worked for the Florida Repertory Theater as a director for over 8 years, opened and ran her own Mount Shasta Repertory Theater when her and her husband, Michael Massari, lived in California, among other notable things. Also, she has been the director since the beginning of the summer program since its inception 4 years ago, and she hopes to continue to make an impact in the theatre community in Lee County schools. Her husband was also a contributor to the show building elaborate sets for the Shrek performance. He is also a theatre professional and added that much more to the integrity of the production. Massari described her love for theatre, especially for children, stating that theatre provides "real choices in an imaginary situation." There is something special about putting on that costume and becoming another character, Massari noted. Once in front of the audience, the audience is then an additional cast member; they bring forth their energy and it's reciprocated by those performing. With Shrek, it was a big hit within the community and surroudning summer camps, that always visit to see the production. North Fort Myers Academy of the Arts Principal Tom Millons wasn't able to attend, he was actually busy accepting a prestigious arts academy award, but he told Massari that his phone started lighting up after the first performance of Shrek. Those that had had the opportunity to see the production couldn't help but tell him how outstanding it was. One of the most memorable moments for Massari was seeing a young actor who had previously taken a lot of direction and was having trouble processing it all. Massari remembers seeing that moment when the light bulb suddenly switched on for them, and then seeing their gratification with it all. She remembers that all of it happened in front of the audience, and seeing reaction was incredibly meaningful to both her and the young actor. Since starting the camp 4 years ago, there have been plenty of both new members as well as repeating members. Children from 3rd grade through high school are accepted into the program, though typically the high schoolers are counselors for the camp. Shrek was the ideal production because there are so many roles where people get to have their own moment, which is always great with a large group. Also, another local high school had performed it a few years ago, so they were able to borrow costumes and alter them, as opposed to starting from scratch, which is a major bonus for such a short program. There was a great team behind Massari to make this summer program possible, something that she wanted to make sure was noted. Her husband Michael "is an amazing builder and set designer and technical director." She also thanked Angel Dobson, the production's music director, who is an "amazing coordinator." The cast's choreographer, Tracy, also got a big thank you. She worked with Massari's daughter, Jesse, who will be junior in high school. Jesse was Tracy's assistant choreographer, and actually choreographed a few numbers on her own. Massari vividly remembers a touching moment when Tracy reached out to her saying that she "realized she didn't have an assistant, she had a partner." 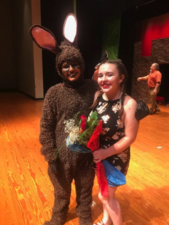 Caleb, Massari's son, ended up playing Donkey and she thoroughly enjoyed seeing him transform into his character, as he is usually more sports-oriented. She wanted to note that the organizers of the show had children in the production, and there is a very strict rule in place where they were barred from casting their own kid, and no there is no disputing allowed. Massari hopes to eventually do things throughout the school year as guest artist, to continue with the development of academic youth theatre in the area. Her goal is to encourage sharing more resources within schools, but that's all in the future for now. "Theatre and the arts are invaluable to development," Massari told us. "I don't expect all students to grow up to go into acting, though some very well could, but it to gives them such a strong foundation to do whatever they want." Keep up with the North Fort Myers Academy of the Arts' next production, "The Lion King," which will be a school production with the school's director and drama teacher Kim Smith.